Why can't we cut our way to prosperity? Apple announcements: "it just works"
Must-read: "I Am John Galt"
While it's clear that inflation expectations have been heating up considerably in the past few years (from almost zero at the end of 2008 to now almost 3%), it's also true that inflation expectations might still be considered to be "anchored" in the sense that they are not outside the range of what actual inflation has been over the past few decades. So far, the market data support both those who worry that inflation is heating up, and those who believe that inflation is still firmly under control. Thus, reasonable men can continue to disagree on this subject. As one of those who worries that inflation is likely to continue to heat up, and potentially sustain a higher level than what we have seen in recent decades, I cite the evidence of a very weak dollar, very strong gold and commodity prices, a very steep yield curve, and a super-abundance of bank reserves which have the potential to create a significant expansion in the money supply. 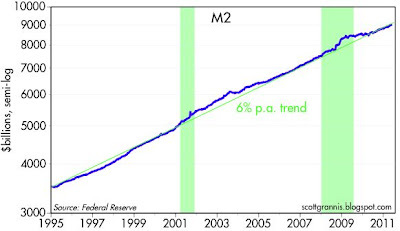 Those who are not worried about inflation cite the economy's weak growth and large output gap (which according to Phillips Curve theory creates significant deflationary pressures), the relatively subdued 6% growth in the M2 money supply, and the significant decline in real estate prices. I would add that on the margin, the evidence lends more support to those who worry than to those who don't. 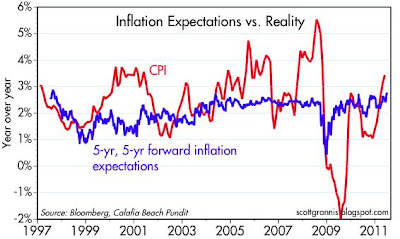 Both actual and expected inflation have been rising this year, much as the market-based evidence (e.g., the dollar, gold, commodities, yield curve) has been predicting, and contrary to what the Phillips Curve theory of inflation has been predicting. I've showed this before, but it's worthwhile repeating. 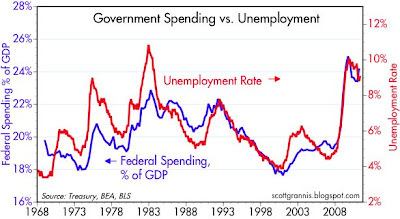 The chart above makes a bold and striking statement: the more the government spends, in relation to the size of the economy, the higher the rate of unemployment; and the less the government spends, the lower the rate of unemployment. That's not the same as saying that rising government spending causes the unemployment rate to rise, since it's very true that rising unemployment forces the government to spend more (e.g., for unemployment benefits and other assistance to those losing their jobs), and rising unemployment goes hand in hand with a weaker economy, and that tends to push government spending higher in relation to GDP. So I want to be careful with the causation/correlation argument here. But the experience of the past several years has been remarkable in that there is no question but that three years ago the government embarked on a major campaign to stimulate the economy via a massive increase in government spending. 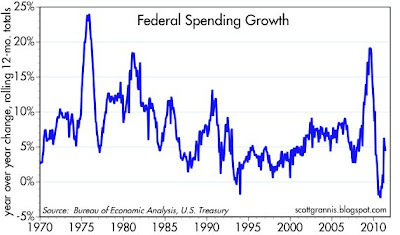 The big rise in spending as a % of GDP in the past three years was mostly driven by a forced increase in spending, and only partially by the fact that automatic stabilizers (e.g., unemployment insurance, food stamps) kick in as the economy weakens. And it is clear that this virtually unprecedented spending boost coincided with the biggest and fastest rise in the unemployment rate, and the deepest recession and slowest recovery in many decades. At the very least this is prima facie evidence that Keynesian pump priming doesn't work, and it's potentially strong evidence that a big dose of pump priming not only doesn't work, it makes things worse. Furthermore, it's evidence that a significant reduction in government spending as a % of GDP does not prevent a significant strengthening of the economy: consider the 1993-2000 period in the above chart, when both spending and the unemployment rate experienced significant declines. Spending is the elephant in the living room, and it needs to be cut back sharply. Government spending doesn't add to demand, it wastes resources. When the government spends more than it takes in, that money has to come from somewhere. And when government spends money it does so much less efficiently than the private sector. Moreover, deficit-financed spending takes just as many resources out of the economy as tax-financed spending. The only difference between the two is that when the government borrows to finance its spending the private sector at least has the hope of recovering the money some day, whereas with higher tax rates there is no hope of recovery. Plus, higher tax rates impact future decisions adversely, since they reduce the after-tax rewards to saving and investing and thus reduce future living standards by depressing investment activity. The debate in Washington over spending cuts vs. higher tax rates is extremely important to the future of the economy. This has nothing to do with partisanship, and everything to do with basic common sense and the facts presented in the chart above. Since more government spending has hurt the economy, less government spending should help the economy. UPDATE: I can see from a number of comments that readers are not getting my point. As I noted above, there is of course a natural tendency for spending as a % of GDP to rise during recessions (automatic stabilizers kick in, increasing spending, while the recession reduces GDP), but what is unique about this recession and recovery is the huge increase in spending (e.g., TARP, ARRA, cash for clunkers, emergency unemployment benefits) that occurred. Without the additional "stimulus" spending, the blue line in the chart above would have increased to 21-22% of GDP, but the additional spending came on top of that. Clearly, an unprecedented amount of spending has done nothing to improve the health of the economy, and most likely has hurt it. UPDATE: Cato's Chris Edwards has nice article explaining more in detail why federal spending doesn't work. The top chart shows unadjusted weekly unemployment claims, while the bottom chart shows the seasonally adjusted numbers. Note in the top chart that there is an upward "blip" in the middle of each year (actually it occurs in the first part of every July). 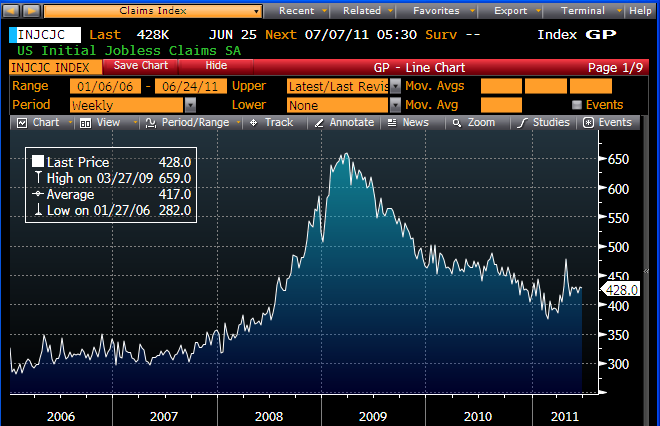 This surge in unemployment claims comes from the annual summer closing of auto plants. The seasonal factors take this into account by subtracting from the actual number, so if actual claims rise by the typical amount, then the seasonally adjusted number is flat. This year is likely to be different, since the auto plant closures happened for the most part a few months ago. So if the actual claims numbers don't rise by as much as expected beginning next week, then the seasonal factors will give us a seasonally adjusted decline which could last through the latter part of July. The coming decline in seasonally adjusted claims should provide some support for the emerging notion that the economy may be picking up somewhat, now that gasoline prices have come back down and the disruption that followed in the wake of the Japanese tsunami begins to ease. In reality, of course, the market hasn't suffered as much as the April rise in adjusted claims suggested—it's simply been in a soft patch; claims have been essentially flat for the past 4-5 months. The market is already sensing improvement, in any event, and that is what is pushing equity prices and Treasury yields higher. July could see some more excitement. 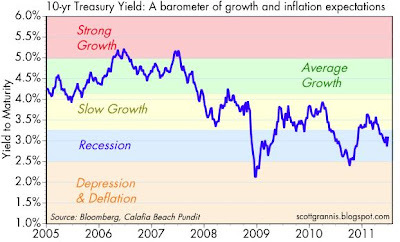 Just five days after I posted that "with 2-yr yields and confidence in the future at record lows, the potential rewards to being optimistic have almost never been better," bang: Treasury yields have shot higher, reducing the price of 10-yr Treasury bonds by 2.1% while wiping out two thirds of a year's worth of coupon yield, and equities are up over 3%. The most visible trigger for this remarkable turnaround is progress towards avoiding a Greek default, but I suspect there are other factors at work as well. I note that the breakeven inflation rate on 5-yr TIPS has jumped by 21 bps in the past five days, as nominal yields have risen 34 bps and real yields have risen by only 12 bps; this signals that half of the rise in nominal yields is due to rising inflation fears, while the other half is due to stronger growth expectations. 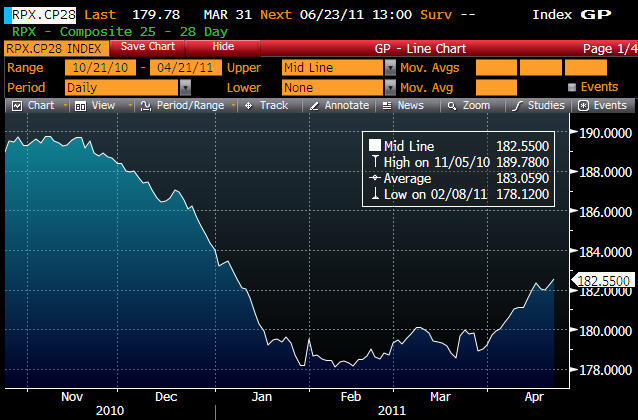 I note also that crude oil futures are up almost 5% in the past five days, and the Vix index has dropped almost 18%. All of this leads me to the conclusion that, as I suspected, the market was depressed more by fear than by fundamentals. 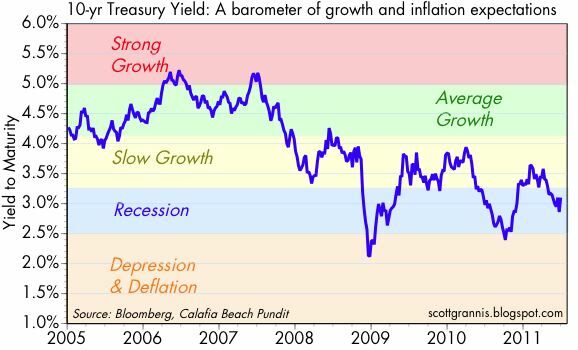 What it all boils down to is this: Treasury yields are a good barometer of the market's growth expectations, and the market's Phillips Curve logic makes growth and inflation expectations move hand in hand. 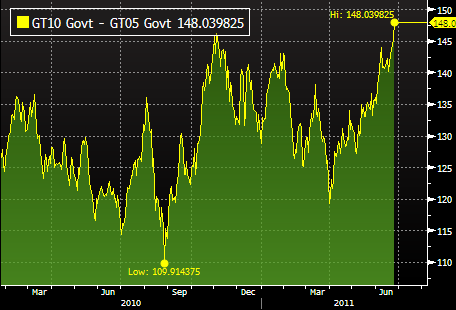 Yields have been trading at very low levels, suggesting that the market had become deeply pessimistic about growth. Higher yields are thus an excellent sign that the outlook for the economy is improving. Higher yields faster, please. My predictions for 2011 are experiencing mixed results so far, but I think I've been more right than wrong. 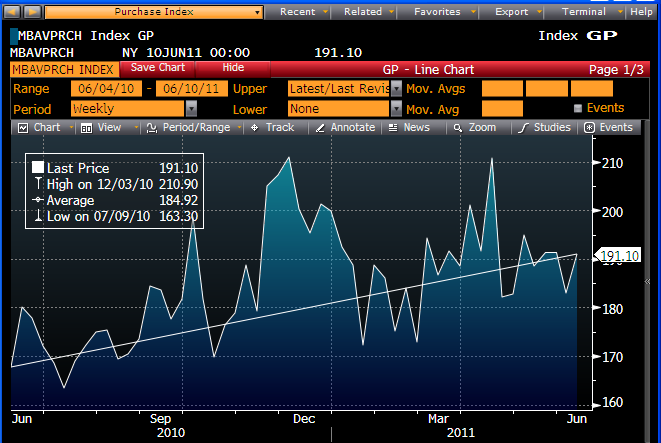 The economy will grow by 4% or more in 2011. Wrong. First quarter growth was only 1.9%, and while I expect that second quarter growth will be in the 3-4% range, growth in the first half of the year will likely be only 3% or so. One reason for the growth slowdown was the supply-chain disruptions that followed in the wake of the Japanese tsunami, but those disruptions are already easing and paving the way for a pickup in growth in the second half. I expect growth will be in the range of 3-4% for the year as a whole, only slightly less than I expected late last year. Importantly, although my growth expectation amounts to only a modest recovery, I think I am more optimistic than the market. 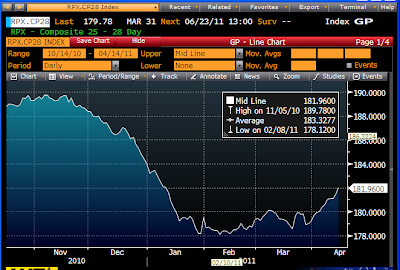 To judge by the very low levels of Treasury yields, I believe the market is expecting growth of 2-3% at best. Inflation will trend slowly higher. Correct. All measures of inflation have turned up this year. On a six-month annualized basis, the CPI has moved up from 3.1% to 5.1%; the core CPI from 0.8% to 2.1%; the PPI from 5.9% to 10.8%; the core PPI from 0.9% to 3.5%; the PCE deflator from 1.9% to 3.9%; the core PCE deflator from 0.4% to 2.0%. On a year-over-year basis, the GDP deflator has moved up from 1.2% to 1.6%. I think it is worth noting here that even though the economy was weaker than I thought, and disappointingly weak even from the market's rather gloomy expectations, there has been a very clear trend towards higher inflation. This runs directly counter to the Phillips Curve theory, which predicts that a very weak economy and a large output gap generates deflationary pressures. 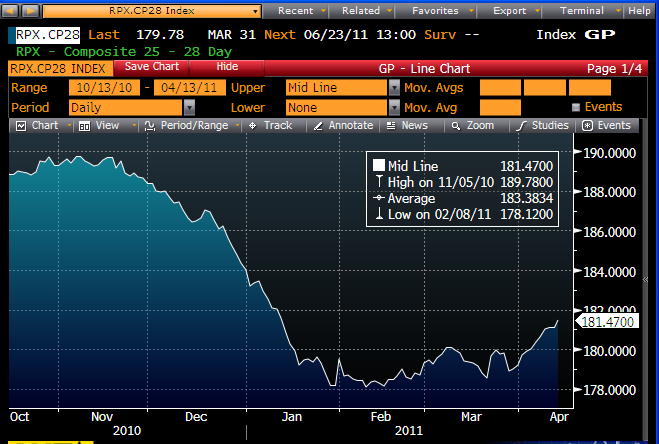 I continue to think we'll see somewhat higher inflation over the next year. The Fed will raise rates sooner than the market expects. Too early to call, but probably wrong. I called for the Fed to raise rates before the end of the year, but currently the market is assigning almost a zero probability of that happening. Unless the economy stages a very impressive recovery in the next several months, I doubt the Fed will hike rates before the end of the year. The housing market will be showing signs of life by the end of the year. Too early to call. 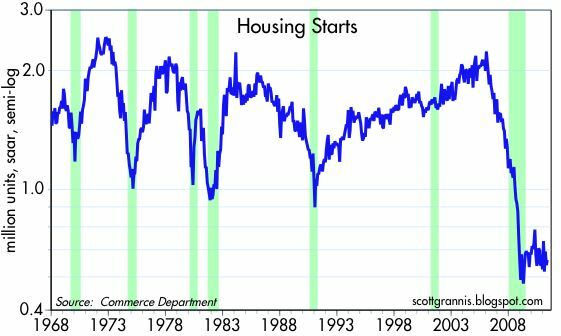 As I have noted in recent posts, there are some signs that housing is bottoming, but it is too early to point to anything concrete. I still think we will see some signs of improvement in housing before the year is out. Interest rates on Treasuries should be higher. Wrong. T-bill yields have fallen from 0.1% to 0.03%; 5-yr Treasury yields have fallen from 2.0% to 1.6%; 10-yr Treasury yields fallen from 3.3% to 3.0%. 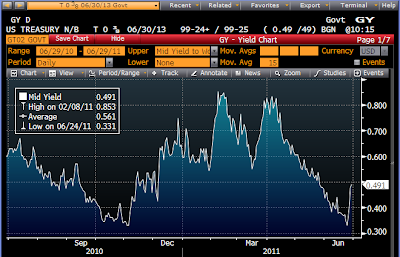 However, 30-yr yields are unchanged at 4.3%. I continue to believe that Treasury yields will move higher this year, and that they offer very unattractive valuations. MBS spreads are likely to widen. Correct. 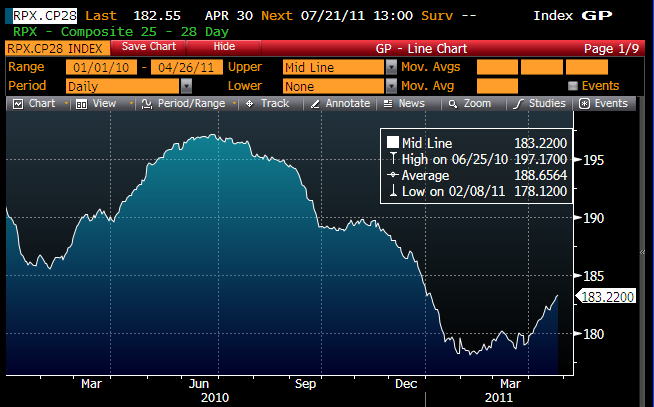 Spreads on current coupon Fannie Mae collateral have widened by about 10 bps so far this year. 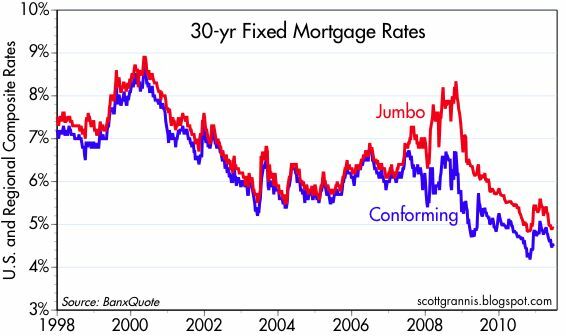 I continue to believe that mortgage spreads will widen as investors worry about extension risk in a rising interest rate environment. 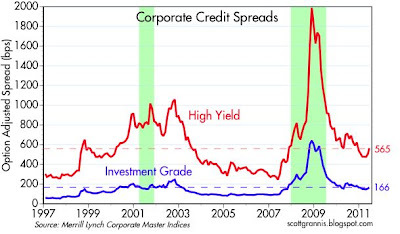 Credit spreads are likely to decline gradually. Correct. 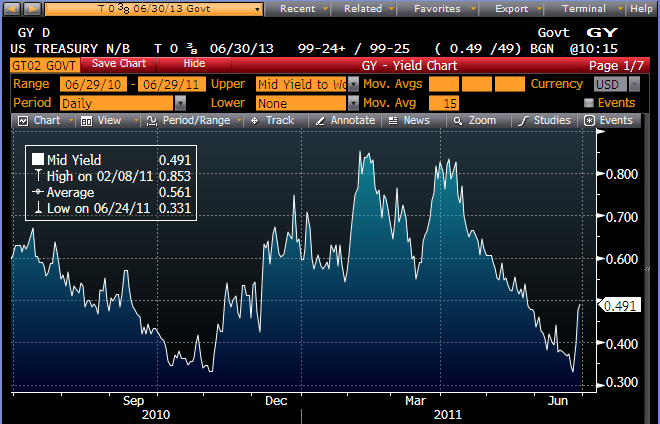 Investment grade spreads have narrowed by about 15 bps, and high-yield spreads have tightened by about 50 bps. Even though growth has been disappointingly slow, corporate profits have been strong, and easy money and rising inflation have improved the outlook for corporate cash flows and reduced the risk of default. I continue to believe that corporate bonds offer attractive valuations. Equity prices are likely to register gains of 10-15%. Correct. The total return on the S&P 500 year to date is 4%, and on the Dow 6.5%. Importantly, despite lots of volatility along the way, the return on equities has been substantially higher than the miniscule return on cash. I continue to believe that equities offer attractive valuations. 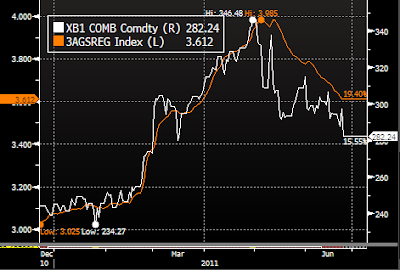 Commodity prices will continue to work their way higher. Correct. 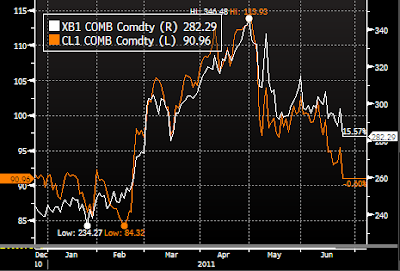 Despite a sharp selloff in the past two months, the CRB Spot Commodity Index is up over 5% so far this year, the JOC Index is up 1%, and Arab light crude is up 20%. I continue to believe that commodity prices will move higher with time, as the economy is likely to pick up and monetary policy remains very accommodative. Emerging market economies are likely to do somewhat better than industrialized economies. Correct. Most emerging market economies are enjoying stronger growth than most industrialized economies. However, most emerging market equities are underperforming those of industrialized economies, as global growth has slowed somewhat. Emerging market debt has generally performed quite well, however. I continue to believe that emerging market equities and debt offer attractive valuations, since these economies tend to thrive in an environment of easy money, rising commodity prices, fiscal policy reform, and ongoing globalization. Gold will probably move higher. Correct. Gold is up 5.5% so far this year. I continue to believe that gold can move higher, given the likelihood that monetary policy will remain very accommodative, but the potential for extreme volatility (especially on the downside) makes gold an unattractive investment for all but the most ardent speculators. The dollar is likely to move higher against most major currencies, and hold relatively steady against emerging market and commodity currencies. Wrong. The dollar is down about 5% relative to major currencies so far this year, and it is also down against most emerging and commodity currencies. I continue to believe, however, that the dollar has significant upside potential, given that it has never been weaker and I think the outlook for the U.S. is likely to improve. The top chart compares the Case Shiller Home Price Index with the RadarLogic Home Price Index. Rarely do you see two indices such as these that use different methodologies to measure complex phenomena track so closely. The bottom chart is a closeup look at the RadarLogic index. What both indices show is what looks to me like a bottoming process that has been taking place over the past two years. Yes, prices are still slipping on a year over year basis, but how much more do they have to fall to clear the market if real home prices are already 39% below their peak, and mortgage rates are at historically low levels? Not much more, is my guess. This chart is very much worth a periodic review, since it illustrates the strong link between monetary policy and the health of the economy. Note that prior to every recession since 1960, the real Fed funds rate (using the PCE Core deflator, the Fed's preferred measure of inflation) has risen substantially. In all but one case, the real funds rate exceeded 4% prior to every recession. The last recession was the only exception to that rule, since the real funds rate only rose to 3%. The level of the real funds rate is a good measure of how tight the Fed is; the higher the tighter. When real interest rates become very high, it is a sign that the Fed is restricting the flow of liquidity to the economy, and money becomes scarce and therefore very expensive to borrow. (They usually do this in response to a rise in inflation.) 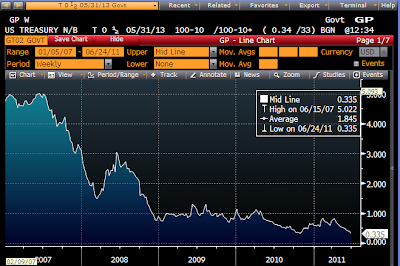 High real borrowing costs begin to snuff out risky initiatives, and increase the demand for money. People begin to prefer letting cash sit in money market funds rather than putting money at risk. Speculative activities become very expensive; it's more rewarding to own a bond than it is to be long gold or commodities. When enough of that happens, economic activity begins to weaken, and those with high debt burdens get crushed. 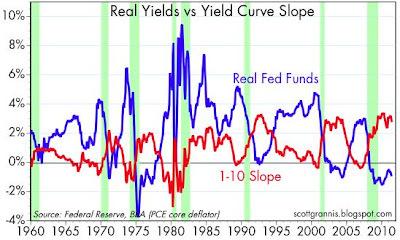 Also note that prior to every recession, the slope of the yield curve from 1 to 10 years was either flat or negative. A flat or inverted yield curve is a classic sign of tight money, because it is the bond market's way of saying that the Fed is so tight that it will almost certainly have to lower rates in the future. The combination of a high real funds rate and an inverted curve is thus an excellent sign that the Fed has put a big squeeze on the economy and a recession is thus very likely. Today the situation is the exact opposite of a monetary squeeze. 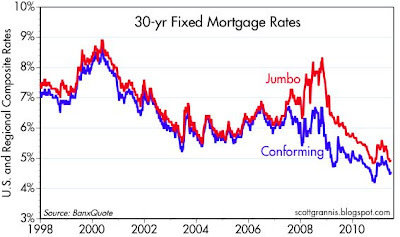 The real funds rate is almost as low as it's ever been, and it has been negative for more than 3 years now. This is typical of the early stages of a recovery. Recessions are provoked by a severe tightening of monetary policy, and once the economy has stalled the Fed reverses course and steps on the monetary gas. Their aim is to make money very cheap to borrow, and to weaken the demand for money. 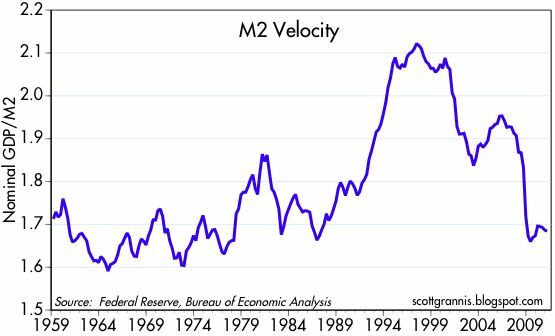 As the demand for money weakens, the velocity of money increases—people start spending the money they hoarded going into the recession, and this helps pull the economy out of its slump. 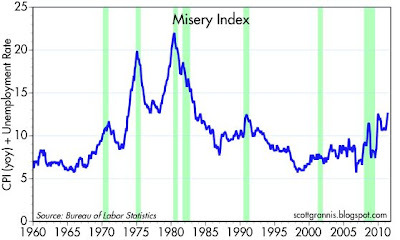 We're now on the upslope of the monetary policy roller-coaster. This recovery has been unusually slow to gain traction, and one reason is that the demand for money remains very high. 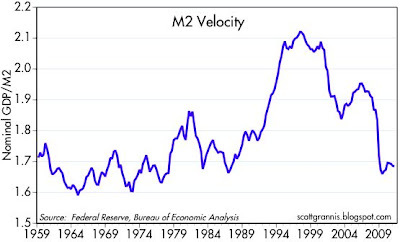 M2 velocity has been very low (because money demand—the inverse of money velocity—has been very strong) since late 2008. Money demand has been so strong, in fact, that banks have been unwilling to use their mountain of reserves to make new loans, and the economy has been unwilling—in aggregate—to borrow more money, preferring instead to deleverage. Banks prefer to hold on to their reserve "cash" instead of spending it on new loans. But this is not to say that the economy will be spinning its wheels forever. One thing we know almost for sure is that the economy is not suffering from a lack of liquidity right now, and liquidity shortages are what have precipitated every recession in the past. It would be highly unusual and surprising to see a double-dip recession any time soon. What is more likely is that the economy will continue to grow, albeit slowly. Why slowly? I have been arguing since early 2009 that we are suffering from a surfeit of stimulus. Fiscal policy is supposedly very stimulative, with federal spending having increased by fully 25% relative to the rest of the economy, generating gigantic deficits that have never been seen in postwar U.S. But excessive government spending coupled with increased regulatory burdens (e.g., Dodd-Frank) and huge deficits actually act to depress the economy in several ways. To begin with, when the government appropriates a big new chunk of economic activity by increasing its spending (and transfer payments), this wastes the economy's scarce resources and creates perverse incentives (e.g., by rewarding the idle and punishing the ones working hard). Second, new regulatory burdens dampen animal spirits by raising the cost of doing business. Third, huge deficits create the very rational expectation of huge new tax burdens, further increasing the cost of business. When you make businesses more costly to run, you should expect to see fewer new businesses. And when you increase tax rates on the margin, this reduces the reward to risk-taking and work, so you should expect to see fewer new businesses and fewer people offering their services to the labor market. Furthermore, the hugely expansive position of the Federal Reserve—with its absolutely unprecedented and off-the-charts purchase of $1.6 trillion of government and agency debt—has most likely weakened the dollar and helped push up commodity prices. There remains great uncertainty about how and whether the Fed will be able to tighten policy in time to avoid an unpleasant rise in inflation—which is already on the rise. Monetary policy fears go a long way to explaining the strong speculative urges that have driven gold and commodity prices to new highs in recent years. And monetary uncertainty has undoubtedly contributed to dampen investor confidence in the future. So to summarize: the chart at the top says we have every reason to expect the economy to continue to grow, but a surfeit of monetary and fiscal stimulus amounts to a significant headwind to growth. Memo to Washington: please stop the stimulus, it's really hurting! Truck tonnage fell in May, most likely due to supply-chain interruptions and higher oil prices. Calculated Risk has more details. I offer this updated chart to show how closely the stock market, not surprisingly, tends to follow the ups and downs of the physical economy. 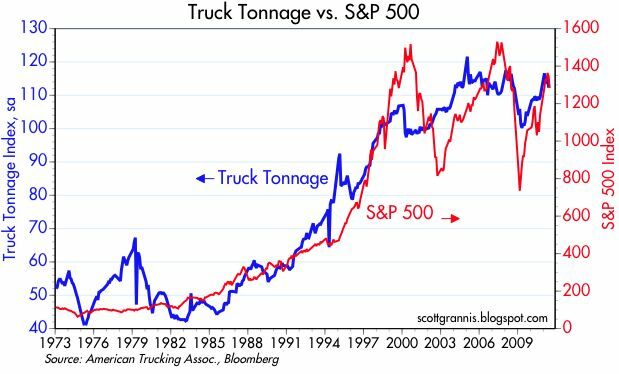 I also note that truck tonnage is a very real indicator of economic growth, and can't be artificially elevated by cheap money or misguided stimulus programs. Trucking serves as a barometer of the U.S. economy, representing 67.2% of tonnage carried by all modes of domestic freight transportation, including manufactured and retail goods. It's reasonable to expect that supply-chain disruptions are now fading, and that, combined with a 20% drop in crude oil prices over the past two months, should allow somewhat stronger growth to resume in coming months. The personal consumption deflator in May came in as expected at 0.2%, but the core version was a bit higher than expected at 0.3%. As this chart of the six-month annualized rate of change of each series shows, inflation is definitely picking up on the margin, regardless of how it's measured. So far this year the core PCE deflator is up at a 2.3% annualized pace. 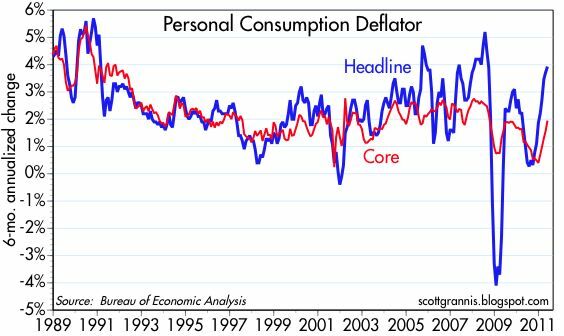 It's notable that both core and headline inflation are moving higher at the same time, since this confirms that monetary policy is definitely accommodative. 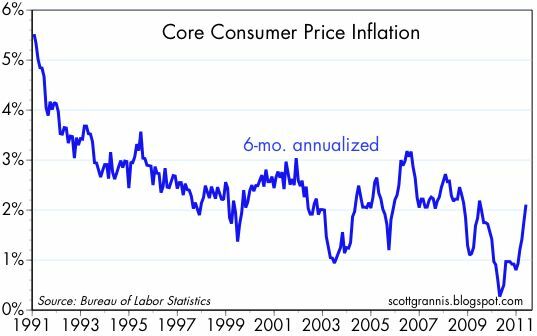 If policy were tight, then higher oil prices would be pressuring other prices to decline, and we would be seeing core inflation falling while headline inflation was rising. Inflation is now high enough to justify the Fed's decision to forego QE3, and high enough to begin to justify the concerns of those who worry that the Fed may have been too easy for too long. 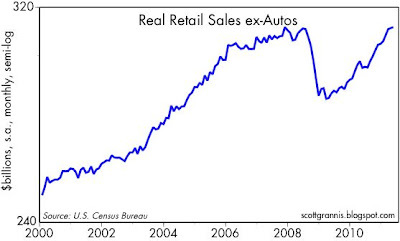 Deflation is dead, of that we can be sure. 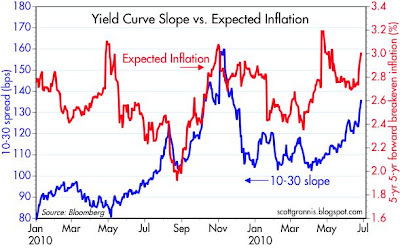 UPDATE: The bond market responds to the news by steepening, sending sensitive, forward-looking inflation expectations higher. 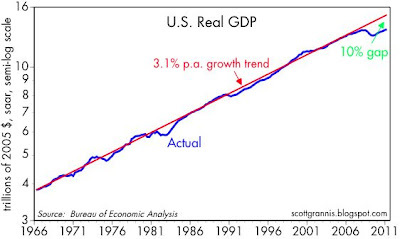 This chart compares the actual path of real GDP to a trend line that equates to 3.1% annual growth. About two-thirds of the trend growth rate is due to increased productivity, while one-third is due to growth in the number of people working. Recessions typically cause GDP to fall below its trend growth rate, and recoveries typically result in faster-than-trend growth. This behavior of GDP was described by Milton Friedman and I've discussed it before. Actual GDP is now about 10% below where it could be if the underlying trends in productivity and population growth remain unchanged. The shortfall is now equal to about $1.5 trillion of lost income per year, and that is the true cost of this very weak recovery that we are experiencing. It's also a good measure of the degree to which unemployment and underemployment impinge on the lives of many millions of our citizens. For all the terrible cost this latest recession and meager recovery have exacted, there is a bright side: the amount of un- and under-utilized resources in the economy is huge, and just waiting to be tapped. If Washington can steer a better fiscal and monetary policy course (e.g., shrinking the size and burden of government, lowering and flattening tax rates, broadening the tax base, and tightening monetary policy) then there is a staggering amount of growth that could be unleashed in coming years. In short, if government can get out of the way of the private sector, the future could be quite rosy. In his weekly radio address today, President Obama said, in regard to the upcoming talks he will be having with Congressional leaders over reviving the stalled budget negotiations, "we can't simply cut our way to prosperity." He might do well to consider the record of the Clinton administration. 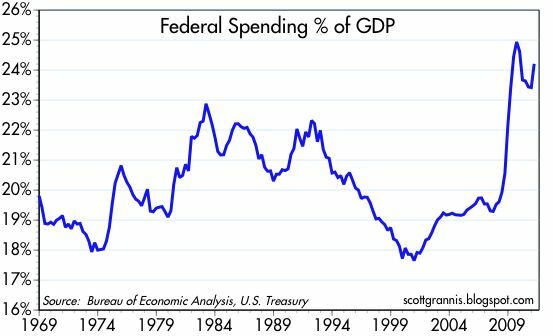 As these charts show, federal spending as a % of GDP fell 4 percentage points—from 22% to 18%—during the 1993-2000 period, thanks mainly to 8 years of very low spending growth: 3.1% on average. During that same period, real GDP grew at an annualized rate of 3.8% per year, well above its long-term 3.1% per year average, and the unemployment rate fell from 7.4% to 3.9%. During that same period, rising prosperity resulted in a surge of federal tax receipts, which rose from 17% of GDP to 20%, as revenue growth averaged 7.8% per year. The combination of very slow spending growth and a strong economy reduced the budget deficit from 5% of GDP to a surplus of 2.5% of GDP. And thanks to the combination of strong growth and tight monetary policy, the dollar rose 20% during this period, further boosting confidence and investment. The hallmarks of policy during the 1993-2000 period are exactly what we need today: 1) sharply curtailed spending growth and 2) tighter monetary policy. It's not a coincidence that explosive spending growth and easy money have given us the slowest recovery on record. Moral of the story: you can't simply spend your way to prosperity. UPDATE: To expand on this most important of themes: You can't spend or print your way to prosperity; prosperity comes only from hard work and productive investments. Government doesn't know how to do either very well, since it lacks the profit motive, and politicians have the luxury of spending other peoples' money instead of their own. Printing money doesn't create prosperity because it only fosters speculation and destroys confidence in the value of a currency. The worst thing about policies of the past several years (including the Bush administration) has been the reliance on policies (e.g., lots of government spending and easy money) that don't make any sense, but which sound good because they supposedly put the politicians and the bureaucrats in charge of pulling the economy out of a slump that they themselves (of course) were responsible for creating. The Keynesian belief that politicians and bureaucrats can pull spending and money levers and thus turn around the economy have once again been totally discredited. How long will it take before we as a country learn this lesson? As this chart illustrates, 2-yr Treasury yields today fell to a record low 0.33%. Bond market math tells us that this means the market expects the Fed funds rate to average 0.33% over the next two years (today it stands at 0.1%). According to the pricing of Fed funds futures, the market is expecting the Fed to remain on hold for at least another year, and then to raise its target rate only modestly beginning some time later next year and reaching 0.8% in two years' time. This is the most pessimistic outlook for future interest rates hikes in modern history. Looked at another way, since Fed policy is strongly influenced by the health of the economy, the bond market is assuming that the outlook for growth over the next few years is dismal at best. By inference, the equity market must also be assuming similarly dismal prospects for future cash flows. However, I find it very difficult to share the market's conviction that growth will be extraordinarily weak and inflation will be tame for the next several years. There are tensions building up in the market that could be resolved rather explosively (and positively) in coming months if the economy picks up as I expect. My guess is that the market is ignoring all these positive fundamentals and instead is paralyzed by the mounting risk of a PIGS sovereign debt default, and by the ballooning size of the federal budget deficit. The Keynesian instincts which permeate the market's thinking are predicting economic disaster as a result of forced fiscal tightening. Budget deficits are going to have to be slashed, and to a Keynesian that means contraction. But as Steve Hanke reminds us in today's WSJ, contractionary fiscal policy—and even budget surpluses—can coexist with a very strong economy. Moreover, it's a fact that despite the huge fiscal "stimulus" of recent years we have had the weakest recovery in modern times. Indeed, it just makes sense that as the government consumes less and less of an economy's scarce resources, that allows the private sector to blossom and expand. The only thing we might have to fear about the coming fiscal "contraction" in the U.S. is that politicians try to replace excessive borrowing with higher taxes, thus avoiding a huge cut in spending. But a significant hike in tax rates at a time when growth is meager is going to be a very tough sell. And as Milton Friedman long ago taught us, the true burden of government is measured by spending, not borrowing or taxes. The only sensible—and the best—solution is to cut back government spending. There is no reason to think that would reduce growth, and every reason to think it could lead to stronger growth. With 2-yr yields and confidence in the future at record lows, the potential rewards to being optimistic have almost never been better. Sometimes you have to really dig into the entrails of the bond market to find important information. 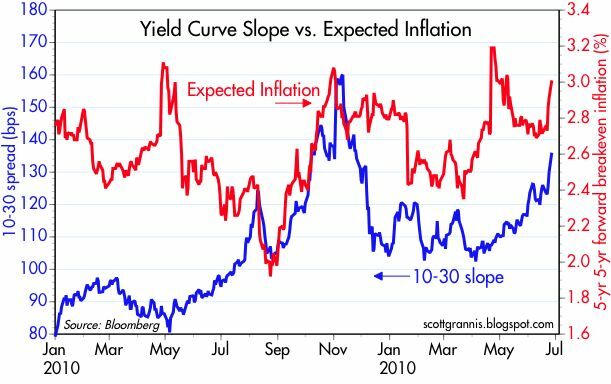 What this chart illustrates is that the changing shape of the yield is reflecting a rise in the market's near-term inflation expectations. One part of the yield curve that stands out is the spread between 10- and 30-yr Treasury yields; this has widened from a low of 102 bps in April to 130 bps today. At the same time, the 5-yr, 5-yr forward breakeven inflation rate embedded in the TIPS market (a sensitive measure of near-term inflation expectations that the Fed pays particular attention to) has risen from 2.4% to 2.9%. Rising inflation expectations can also be seen in the above chart, which measures the spread between 5- and 10-yr Treasury yields. This spread is now as wide as it has ever been. This is a direct reflection of the Treasury market's fear that inflation is going to be higher in the second half of the next decade than in the first half. The last time all of these measures of inflation expectations rose in tandem was in the Sept-Oct '10 period, as the market began to fear that QE2 (which began in November) would be inflationary, and the economy began emerging from its April-August '10 slowdown. Consider the factors which have been driving the steepening of key parts of the Treasury curve. To begin with, the economy's sluggish growth of late, coupled with the market's lack of confidence that growth will improve in the future, have created the expectation that the Fed will keep short-term interest rates extremely low for at least the next year. The Fed of course has helped foster these expectations with its repeated use of the "extended period" language, and its ongoing concerns about weak growth, high unemployment, and deflation risks. Currently, the market does not see any appreciable chance of a Fed tightening until the third quarter of next year, according to Fed funds futures contracts. If the market's expectations are realized, the Fed funds rate will have been 0.25% or less for fully three and a half years—which would mark a truly unprecedented period of accommodative monetary policy. With policy so easy for so long, the risks of an unwelcome rise in inflation become too big to ignore. No wonder the price of gold has doubled, to $1500/oz., since late 2008, and the dollar has dropped by 15%. 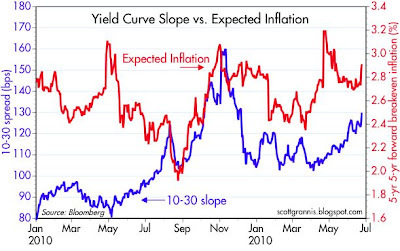 No wonder the front part of the yield curve has never been so steep. 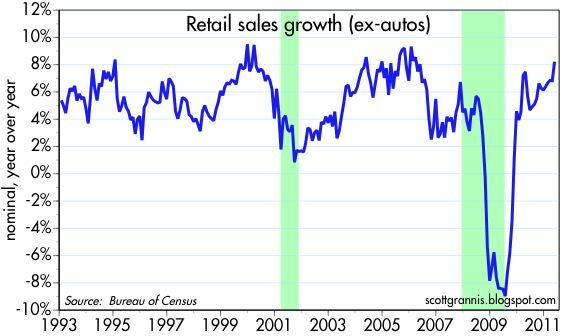 Even if real growth continues to disappoint, the economy still shows every sign of continuing to grow. I don't see why GDP can't post at least 3% growth for the foreseeable future, but that would of course leave the economy about 10% below its potential growth, and that in turn implies the unemployment rate will remain quite high for some time. And if inflation accelerates further—the year-over-year GDP deflator has already picked up from 0.2% in Sep. '09 to 1.6% in Mar. '11, and the CPI has gone from -2% in July '09 to 3.4% in May '11—then we will see a significant pickup in nominal GDP going forward. Capital goods orders (a good proxy for business investment) in May broke out of their early-year slowdown, rising 3.5% above the previously reported level for April. They rose at a strong 10.3% annualized rate in the past six months, and are up a solid 10.5% in the past year. This is a key reason to remain optimistic about economic growth, since business investment today is the seedcorn for future growth. 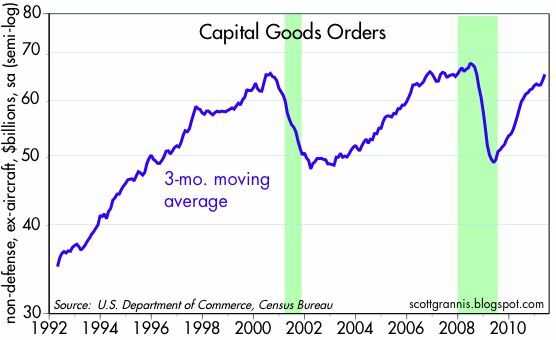 Since hitting a post-recession low in April '09, capital goods orders have surged 39% are now only 3.4% below their pre-recession high. This has been an excellent recovery from the standpoint of business investment, but still disappointing from a long-term perspective. Consider that the level of investment today hasn't increased from where it was in the year 2000, while the economy has grown almost 20% over the past 11 years. There is still a lot of catching up to do. When business investment fails over the years to keep pace with the growth of the economy, that can only mean a slower rate of growth going forward. Investment is needed to raise worker productivity, and productivity—which has averaged about 2% a year for the past several decades—is a major source of growth, which averaged about 3% a year until several years ago. The lagging pace of business investment over the past decade is also disappointing when you consider that corporate profits after tax have more than doubled in the same period. 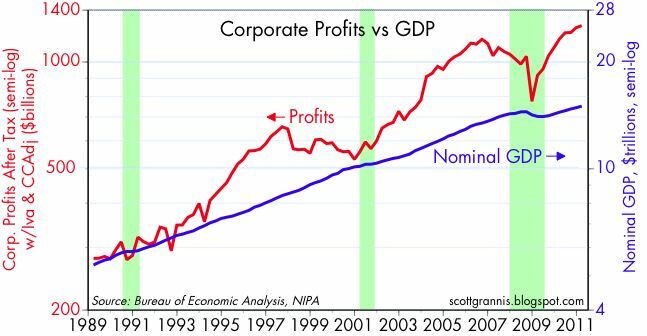 After-tax corporate profits now stand at 8.4% of GDP, just 20 bps below their highest level ever. Corporations have been piling up massive amounts of cash on their balance sheets in recent years, but it's important to remember that all the money saved by people and business in any given year is always spent by someone else. As it turns out, our federal government has effectively borrowed and spent every dime that businesses have saved since the recovery started. The federal deficit has totaled $2.55 trillion since the recovery started, while total after-tax corporate profits have been $2.06 trillion over the same period. With businesses unwilling—for whatever reason—to reinvest surging profits, the federal government has stepped in to fill the gap. But since government spending (a portion of which is euphemistically termed investment) is almost certainly less efficient and less productive than private sector investment, the source of our lagging growth (with an output gap I estimate to be almost 10%) becomes obvious. As a country, we have squandered trillions of dollars by allowing the federal government to greatly expand its control over the economy's scarce resources. Federal spending as a % of GDP has grown by an explosive 24% since the end of 2007. 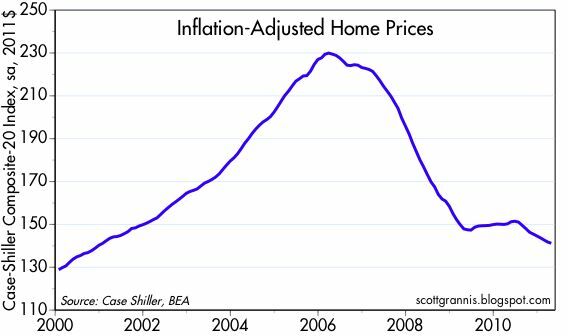 Everyone knows that housing prices are falling, right? This chart, however, is intriguing because it suggests that's not necessarily true. The chart comes from the RadarLogic survey of prices in 25 metropolitan areas, and, like the Case Shiller home price index, it has a substantial built-in lag of about 3 months. The price reflects the average cost per square foot of homes sold (not seasonally adjusted), and the most recent price comes from the average of sales in the 28-day period ending April 21st. There is some seasonality in the data (prices tend to rise in the second quarter of every year), so the best way to compare the trend in home prices is using a year over year comparison. On that basis, home prices are down about 5%. Compared to two years ago, however, prices are down only 3%. The comparable Case Shiller price index shows prices down only 1.4% in the two years ending March '11. The top chart compares crude oil (orange) and wholesale gasoline prices (white), and the inference I draw is that crude prices are leading gasoline prices on the way down. Today's $91 crude price suggests that wholesale gasoline prices should fall to at $2.70/gal or less. The bottom chart compares wholesale gasoline (white) and regular gasoline prices at the pump (orange); the tight correlation between the two suggests that if wholesale gasoline prices fall to $2.70, then prices at the pump should fall to $3.40 or less, compared to today's $3.61 average nationwide price for regular. That would result in a 15% net decline in gasoline prices from April's highs, which in turn would reverse most of the bulge in oil prices that started last February. If higher crude and gasoline prices contributed to the economy's slowdown in the first quarter, which seems likely, then the reversal in prices over the past two months should help support the economy this summer. P.S. And all of these price declines so far have happened without any assistance from government policies. It's been a natural market reaction to the combination of a rise in price and a rise in crude inventories. Today's announcement by the IEA that it will be releasing crude inventories into the market will likely have only a minimal impact compared to the larger fundamentals that are driving the market. Just when you thought that commodity prices were correcting and the Asian economies were slowing down and inflation—according to today's FOMC release—was set to decline in coming months, I bring to your attention the fact that the CRB Livestock index (a subcomponent of the CRB Foodstuffs Index, which in turn is a major subcomponent of the CRB Spot Commodity Index) has been setting new all-time highs in the past week. 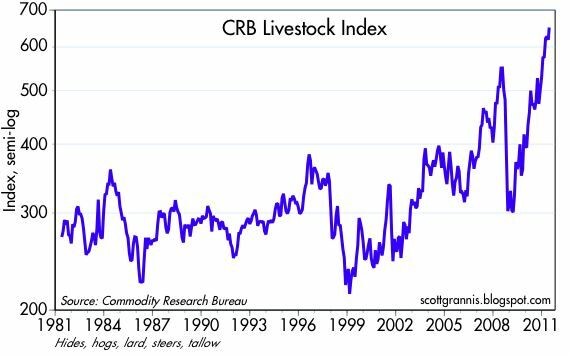 This measure of livestock prices has soared 138% since March 2009. Are speculators hoarding hides, hogs, lard, steers, and tallow? 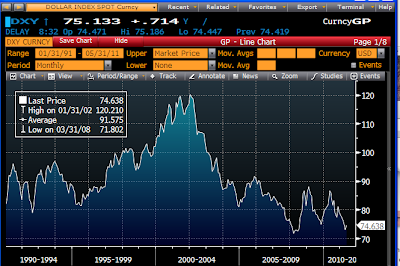 Or is global demand robust and the dollar very weak? My money's on the latter. Today the FOMC announced the end of its incremental quantitative easing efforts. The Fed won't undertake a QE3, but it will keep in place—for now—the extra $1.6 trillion of reserves that it has supplied to the banking system via its purchases of Treasury and agency debt. There will be no tightening of monetary policy, and there will be no further easing: monetary policy will remain plenty easy as it is. The market reacted to the news with what amounts to a yawn, which is good. 10-yr Treasury yields were unchanged on the day, after having declined some 60 bps since February; stocks fell marginally today, and are down only about 5% from their recent highs. The decline in Treasury yields and stock prices reflects a market that has soured on the economy's growth prospects, but not a market that is fearful that a Fed on hold—with interest rates close to zero—poses any significant threat. The contrast between the two charts above underscores a reality that is not widely understood or appreciated. 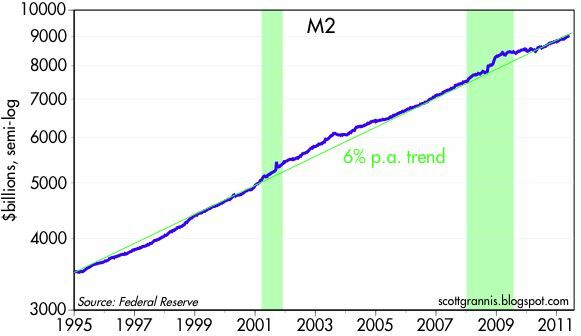 The Fed has injected a massive amount of bank reserves into the financial system, but this has not resulted in any unusual growth in the broad M2 money supply. The extra reserves have not been used by the banking system to make new loans, because banks have instead preferred to hold those extra reserves in order to bolster their balance sheets. Without any meaningful increase in the amount of money sloshing around the financial system, there is no meaningful risk that inflation will soar to frightening levels. In short, although the numbers are theoretically terrifying ($1.5 trillion of extra bank reserves could potentially result in a doubling of the M2 money supply and a huge increase in inflation), the reality is that nothing much has happened. That's not to say that nothing unseemly will happen, of course. It's quite troubling that the dollar is just about as weak as it has ever been, and $1500 gold is makes a powerful statement to the effect that the world is seriously worried about the future of the dollar. But despite all the lingering bad news, it's reassuring to know that there is no shortage of important measures of economic health that are in good shape or materially improving. Corporate profits are very strong; the economy has created over 2 million private sector jobs since the recession low; swap spreads are very low; the implied volatility of equity options is only moderately elevated; the yield curve is very steep (thus ruling out any monetary policy threat to growth); commodity prices are very strong (thus ruling out any material slowdown in global demand); the US Congress is debating how much to cut spending, rather than how much to increase spending; oil prices are down one-third from their 2008 recession-provoking highs; exports are growing at strong double-digit rates; the number of people collecting unemployment insurance has dropped by 5 million since early 2010; federal revenues are growing at a 10% annual rate; households' net worth has risen by over $9 trillion in the past two years; and the level of swap and credit spreads shows no signs of being artificially depressed (thus virtually ruling out excessive optimism or Fed-induced asset price distortions). When you put the latest concerns about the potential fallout from a Greek default (which is virtually assured and has been known and expected for months) against the backdrop of these positive and powerful fundamentals, the world doesn't look like a very scary place. 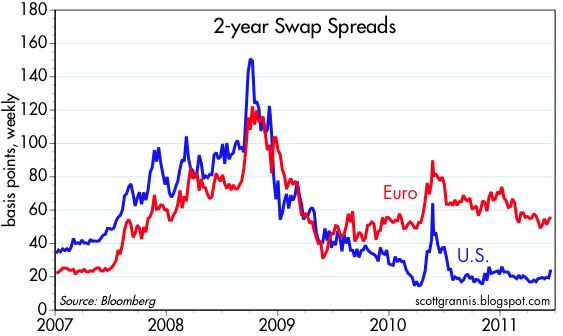 With all the concerns about the U.S. economy being in a soft patch (and possibly entering a double-dip recession), and Europe being plagued by imminent PIGS defaults, credit spreads have understandably widened of late. 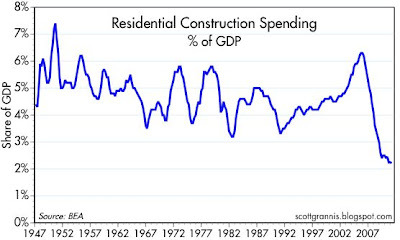 But as the chart above shows, this widening has been rather tame when viewed from an historical perspective. Furthermore, the widening of spreads has occurred mainly as a result of declining Treasury yields; yields on high-yield debt haven't fallen as much as Treasury yields have. (The widely-followed HYG ETF is down only about 3% from its recent highs.) I note, moreover, that spreads remain quite elevated relative to their lows since 1997. 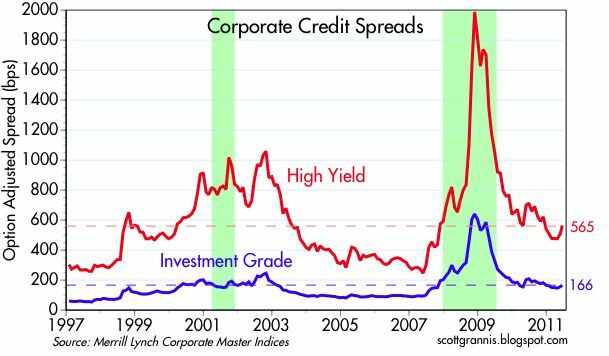 Investment grade spreads today are almost as wide as they were during the 2001 recession, and high-yield spreads are more than twice as high today as they were in mid-2007. The best explanation for why spreads have only widened marginally, despite the long list of concerns which currently weigh on the market, is that the market has been priced to a lot of bad news for some time now. Put another way, valuations in the corporate debt market have been and continue to be depressed. 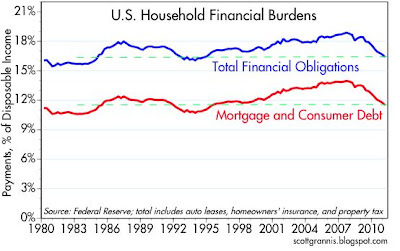 Today the Fed released data for Q1/11 that show that households' financial burdens continued to ease. Total financial obligations (auto leases, homeowners' insurance, property tax, mortgage and consumer debt), as a percent of disposable income, have fallen 13% from their Sep. '07 high. 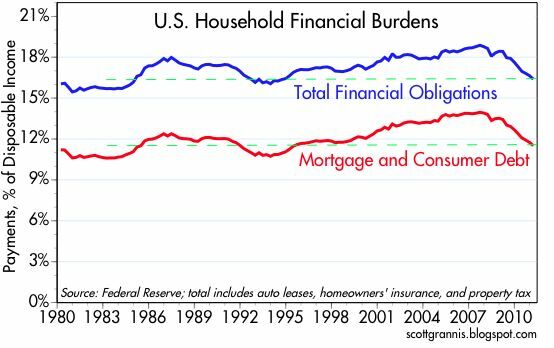 As the chart above shows, debt and financial burdens have on balance been unchanged since 1985, after a rise in the mid-2000s. The upshot of all this is that there has been some meaningful deleveraging going on in recent years. As I have pointed out before, this deleveraging occurred during a time of economic recovery—debt is not essential for a recovery, and reducing debt is not necessarily contractionary. Debt can facilitate economic activity, but it is not necessary for growth. The problem with debt comes when consumers and/or businesses increase their borrowing in the belief that their financial health will be unchanged or improved in the future, only to find out that the future did not turn out as expected. This is not a fatal problem, but it does throw a wrench into the economy's gears that can take some time to work out. The ongoing reduction in financial burdens is a healthy sign that reflects the fact that people and businesses have been actively adjusting to changing circumstances, and it is this dynamic response to adversity that sets the stage for a new cycle of growth. I would note in that regard that the last time we saw significant household deleveraging was in the 1990-95 period; over the subsequent five years, the economy grew by more than 4% a year. UPDATE: To answer several readers' concerns, I believe the data for this chart include student loans, since they are included in the Fed's Consumer Credit release. 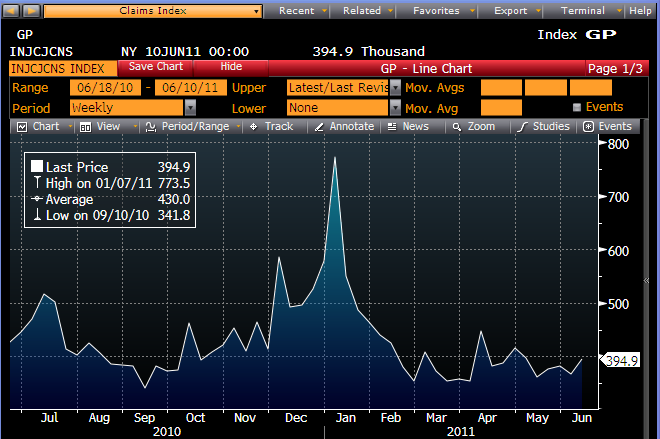 This index, the sum of the CPI and the unemployment rate, will likely be the focus of next year's elections. I expect that CPI will be in a modestly rising trend for the next year, and it's likely that the unemployment rate will decline modestly. If those predictions hold, the Misery Index will be at least as high as it is today, and that will be enough to fuel discontent with the economy. While the index has risen significantly since Obama took office (from 7.8 in Jan. '09 to the current 12.7), most of the rise is due to inflation, which rose from 0 in Jan. '09 to the current 3.6%. 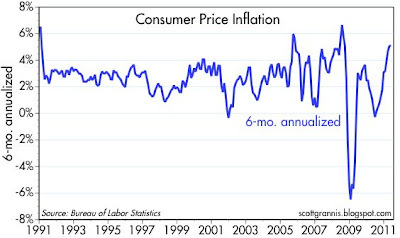 To be fair, inflation is the purview of the Fed, not the president, as I argued yesterday. The unemployment rate has only risen from 7.8% to 9.1% on Obama's watch, whereas it rose from 4.2% to 7.8% on Bush's watch. So we've now had two and a half years of very low and very flat housing starts. It took the nation's homebuilders three years to throttle back the construction of new homes by about 75%, and they've held to those minimal levels since late 2008. Residential construction is now only about 2% of GDP, which is almost next to nothing. If starts were going to decline further, it would have happened by now. In the meantime, new household formations have continued at a pace substantially higher than new home construction, and so the excess inventory of homes has been sharply reduced. The next shoe to drop is painfully obvious: a shortage of homes is inevitable at some point, so new construction, and housing prices, will have to start picking up. It's only a matter of when. The housing price data from Radar Logic, shown in the chart above, offer a tantalizing hint: the long-awaited rebound in the housing market may already be underway. It's too early to be sure, since the price bounce is still very modest, but the passage of time suggests this bounce may well be the real thing. The April bulge in weekly unemployment claims, which kicked off the latest round of concerns that the U.S. economy is entering a double-dip recession, continues to fade away. The top chart shows the seasonally adjusted (reported) number, while the bottom chart shows the unadjusted number. The raw data show that claims have been flat since mid-February, while the adjusted data show a big rise starting in April. The difference between those two numbers is the seasonal adjustment factor. 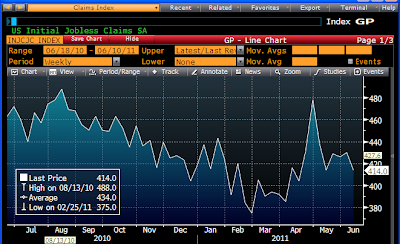 That factor expected to see a decline in actual claims beginning in April, and instead claims turned out to be flat. So the adjusted number was bumped up. Claims were flat instead of declining because auto plants accelerated their layoffs, which would normally have occurred in July, because of the supply disruptions which cascaded through the global manufacturing system in the wake of the Japanese tsunami. We are now beginning to see the payback for this whole charade. Actual claims rose a bit last week, but the reported number declined, which means that the seasonal factors expected to see an even bigger rise in actual claims. If the expected auto layoffs do not occur next month (because they have already happened), then the seasonal factors will produce a very large decline in reported claims. And the press will announce that the economy once again avoided a double-dip recession. When in fact nothing at all happened out of the ordinary. The big talk today is about Greece, and how default looms and social tensions are escalating. As the chart above shows, yields on 2-yr Greek government debt have soared to 28%, a sure sign that investors fully expect a significant restructuring (a polite word for default) of Greek debt within the foreseeable future. Yet as this next chart shows, 2-yr Eurozone swap spreads have hardly budged, even as Greek default risk has soared. 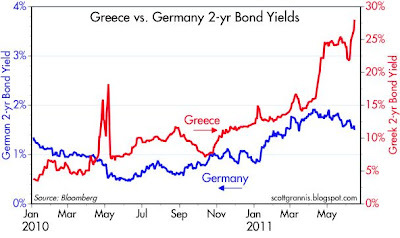 What this says is that while the market is convinced that Greece will default, the market is only moderately concerned that the risk that a Greek default will prove contagious or otherwise threaten the European banking system. 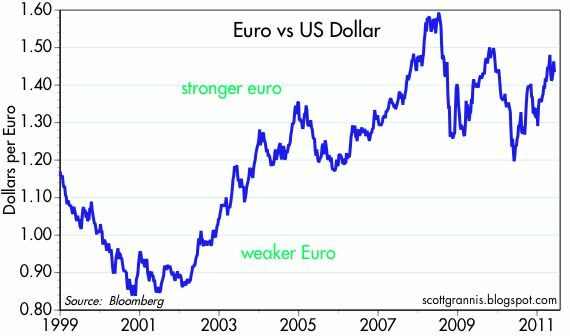 And despite lots of talk about how a Greek default might force Greece to leave the euro, and how this might be the start of the unravelling of the euro, the euro remains at the upper end of its valuation range against the U.S. dollar. In short, the market is telling us that a significant Greek default is likely, but that it will have only a limited impact on the rest of Europe, and by extension, the world. Markets have had plenty of time to prepare for this event, so it is not likely to be very disruptive. As the chart above shows, new applications for mortgages have increased about 14% in the past year. This is an encouraging sign that suggests new buyers are coming into the market as banks liquidate their housing inventories. 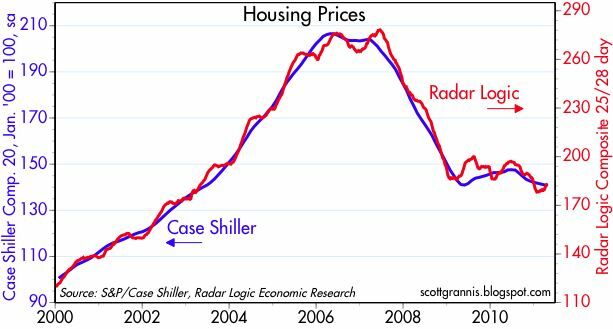 Another encouraging (though still very preliminary) sign is the rise in housing prices since January, according to the folks at Radar Logic (chart below). Consumer price inflation topped estimates by a bit in May, but that's only part of the bigger story. As the chart above shows, over the past six months the CPI has increased at a 5.1% annualized rate, having accelerated sharply from a zero rate in the first half of last year. That is indeed a significant pick-up. 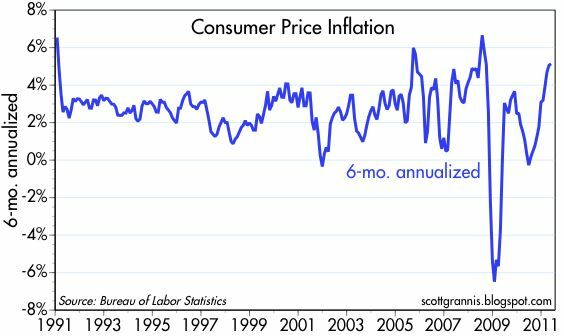 Notice also that inflation has been unusually volatile over the past 10 years (standard deviation = 2.2%), especially as compared to the prior 10 years (standard deviation = 0.7%). 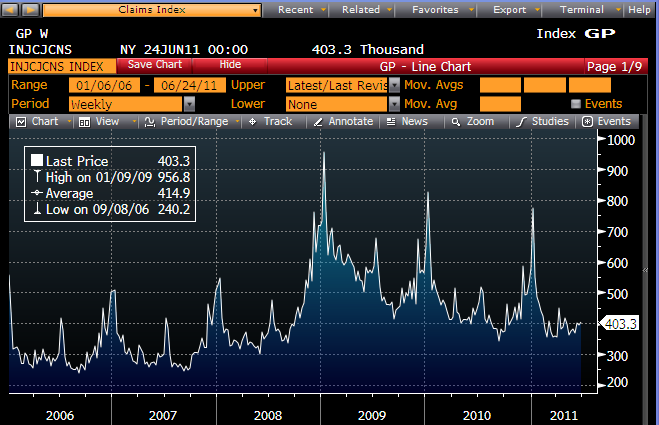 Three times more volatile, in fact. This is not a coincidence, since Fed policy in the 1990s was proactive and consistently tight, whereas Fed policy since 2001 has been generally reactive and mostly easy. This is like the difference between driving by looking through the windshield compared to driving by looking in the rearview mirror. The pickup in inflation is not limited to the headline number either. As this next chart shows, the core CPI has increased 1.5% over the past year, and as the next chart shows, over the past six months the core CPI has increased at a 2.1% annualized rate; like its headline counterpart (compare to first chart), the core CPI has accelerated meaningfully from an almost-zero rate in the first half of last year. 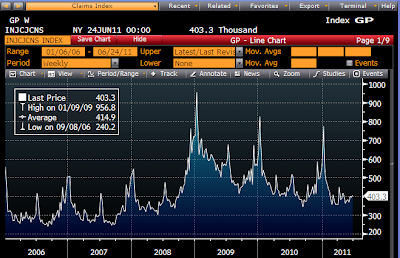 It also has experienced significantly higher volatility in the recent decade than in the prior one. So the volatility of inflation is not just coming from food and energy prices, it's most likely coming from erratic and accommodative monetary policy. Finally, as the above chart suggests, with inflation heating up we have likely seen the lows in 10-yr Treasury yields. To further prove my point that monetary policy is the force behind inflation, note in the chart below how the dollar was generally stronger in the 1991-2001 period, while it was generally weaker from 2002 on. Tight monetary policy keeps the dollar strong and inflation stable, while accommodative monetary policy leads to a weak dollar and more volatile and higher inflation. 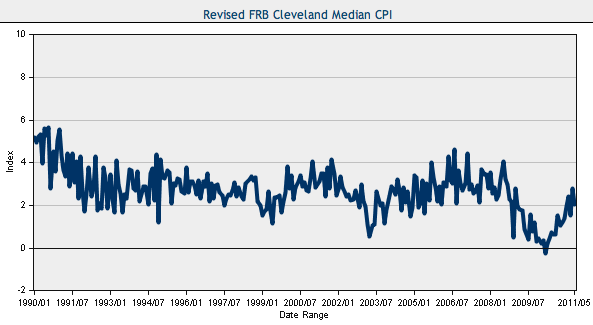 UPDATE: The chart below shows inflation according to the Cleveland Fed's Median CPI. To calculate the median CPI, the Federal Reserve Bank of Cleveland looks at the prices of the goods and services published by the BLS. But instead of calculating a weighted average of all of the prices, as the BLS does, the Cleveland Fed looks at the median price change—or the price change that’s right in the middle of the long list of all of the price changes. 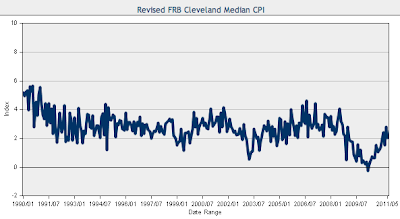 According to research from the Cleveland Fed, the median CPI provides a better signal of the inflation trend than either the all-items CPI or the CPI excluding food and energy. 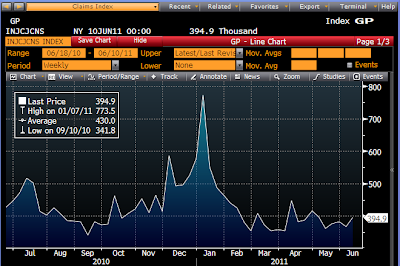 I have long questioned whether the median CPI is the best way to judge the underlying inflation trends. 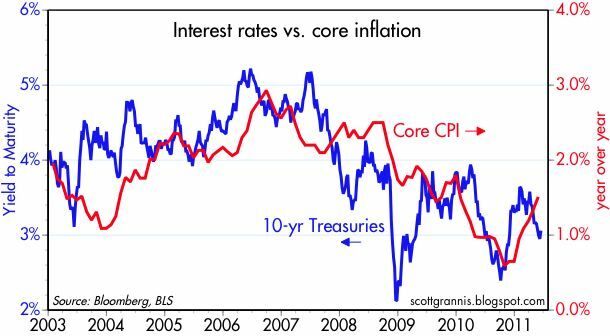 I've argued that inflation was rising long before the median CPI turned up, and I based my forward-looking view of inflation on the behavior of the dollar, gold, commodity prices, and the slope of the yield curve. In any event, it's nice to see that the median CPI now agrees with the other forward-looking indicators that I follow: inflation is heating up. It's not dangerously high by any means, but there is a clear upward trend which is likely to continue. Clifford Asness has a very nice op-ed in today's WSJ: "Uncertainty is not the Problem." 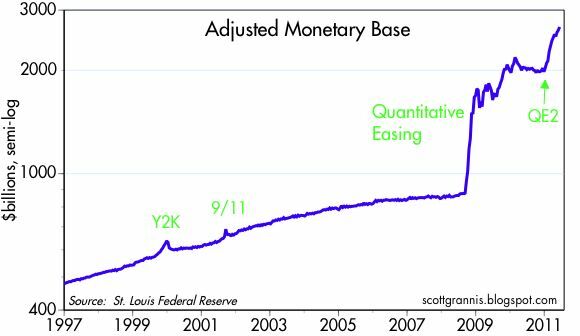 I'm guilty of doing what he describes, which is arguing that the uncertainties created by massive quantitative easing and a huge expansion of government spending are acting as headwinds to economic growth. It's not the uncertainty surrounding bad policies (e.g., a huge increase in spending today means we could see a huge increase in future tax burdens) that is bad for the economy, it's the bad policies themselves. Unless policies change, we will see higher tax burdens and greater regulatory burdens, and that is bad; the fact that there is still some uncertainty about how bad it will be for the economy, or exactly how much tax burdens will rise, is not as important as the fact that the future looks less attractive for business. ... the stimulus was wasteful and politicized, and the American people, not being idiots, know they will have to pay for it eventually. People adjust their plans to account for the additional debt heaped on them, meaning lower investment and consumption. ... consider good policies surrounded by uncertainty. Imagine we will move from here toward free-market health-care reforms appropriate for a free people. We will reduce government spending and our debt, letting people spend their own money as they see fit. We will lower taxes across the board for individuals and businesses, and we'll reduce and simplify deductions. Imagine even more that we'll make grown-up decisions and reform entitlements to levels we might possibly afford. Now imagine that while we know the direction of each of these policy changes, alas, we are very uncertain about how far these wonderful ideas will go. Imagine this uncertainty is even higher than it is around today's bad policies. Would these changes, uncertainty and all, make things better or worse? Well, it seems pretty clear that should these changes occur in any nontrivial fashion, you would have to duck to get out of the way of the ensuing economic boom, regardless of the uncertainty. Focusing on "uncertainty" takes our eyes off the ball. We should not seek clarity about the many new drags on our economy. We should seek to have the administration cease and desist, then reverse them. This reinforces my belief that the plunge in equity prices in the early months of 2009 was largely driven by the horror show that was otherwise known as almost $1 trillion of fiscal "stimulus." Prices have rallied since then because a) the economy did not collapse into a black hole of depression and deflation as the market expected in late 2008, b) the market began to see that Obama's lurch to the left was meeting resistance, and c) more recently, the market has begun to believe that policies might at some point reverse, in a more growth-friendly direction. If the elections next year have the effect of reducing spending, reforming entitlements, flattening tax rates and broadening the tax base, then there is a tremendous amount of upside potential in the market. The only uncertainty is the degree to which things will improve. Already we see that the political debate has shifted meaningfully: nobody can argue successfully for more spending and new entitlement programs—the political debates now turn on whether and by how much we can cut spending and reform entitlement programs. These charts show the rather exceptional strength of retail sales excluding autos (which make sense to exclude because of the tsunami-related slowdown in auto production and sales in recent months). Nominal sales have surged over 8% in the past year, while real sales are up 5.6% and have now staged a complete recovery to their 2007 highs. This is not a picture of an economy teetering on the verge of a double-dip recession. 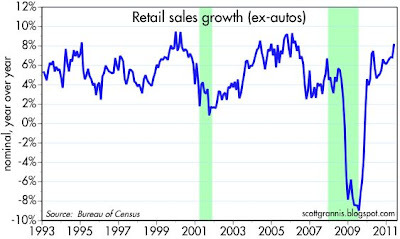 Sales have recovered to pre-recession highs because employment is once again growing, and those who are working are much more productive—non-farm productivity is up 8.6% since the end of 2007. This is another testament to the inherent dynamism and strength of the U.S. economy, and the tenacity of workers and entrepreneurs who continue to seek to improve their lot in life despite the fiscal policy headwinds.